Getting Started is one of the toughest steps that you have to take in the process of building your website. Several customers have confessed that they have put off beginning of their website because the project seemed so overwhelming. Well, it can be overwhelming; but, if you can find a design team experienced enough to help you through it, everything will go smooth and your website will be up and running in no time. We have developed websites for many type of businesses. If yours belongs in an area that we have never dealt before, we will take the time, study it, and advice you on what you need, and what you don't. We will guide you through everything you need to do and we take as much of the burden off of you as possible. Our experience in developing dynamic websites help us anticipate our customer's needs, and make the planning and development process as easy as possible. A website is something to enhance your business, not take your time away from your business. You may be wondering why you need a website. We can explain many advantages to developing a website but ultimately, you will know when the time is right and what you can provide to your customers through this medium. To get off to a good start, you should probably understand exactly what is involved. If you have decided to have a website, the first thing you need to do is select a domain name and register it. The most common choices are your company name or product followed by .net or .com. For example, companyname.com or myproduct.com. If your selected name is still available, you should register it. That will give you the right to use it untill you will cease to pay for it. For all your domain name registration needs we strongly recommend Registrar4u. For Australian Domain names Domains. They have affordable registration rates, your renewal rates will be no higher than the rate you pay when you initially register your domain name, they don't have hidden fees, and their customer service is friendly and quick. 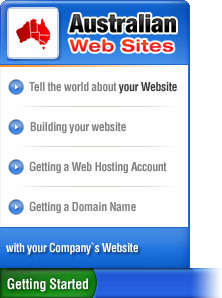 Someone has to host your website or it can't be found when someone types in your domain name. A website is usually a colection of files that are linked together in an intuitive manner. They need to stored on a computer that is never turned off, and it has a flowless internet connection. That computer is called a Server. With those 2 steps out of your way, you will need to find someone to design and build your website. You will need someone who listens to your ideas, tries to understand your business, identifies your potential customers and competitors, and help you decide on the message that your website will state. Knowing that "the image speaks more than a thousand words", the design should reflect your business and generate a positive effect on your website's visitors. It takes more than a great looking website to be successful in today�s competitive Internet world. Over 70% of Internet traffic in some way involves a web search. Just putting a website online won't guarantee it's success. First of all, you need to tell search engines about your website. That is called 'Search Engine Submission'. A perfect combination of optimization and submission will guarantee some Search Engine Placement that might be enough if you don't need a heavy-duty promotion. But, if you need to reach a wide variety of consumers, and you are targeting a competitive market, First Web can help you with advanced Search Engine Optimization, targeted online marketing campaigns, Email Newsletters, etc.